Our series on Woodstock, the greatest rock festival of all time, continues with a recap of what some of the attendees encountered. Let’s get real: It was three days of relative peace, love, music, chaos, and a whole lot of mud. 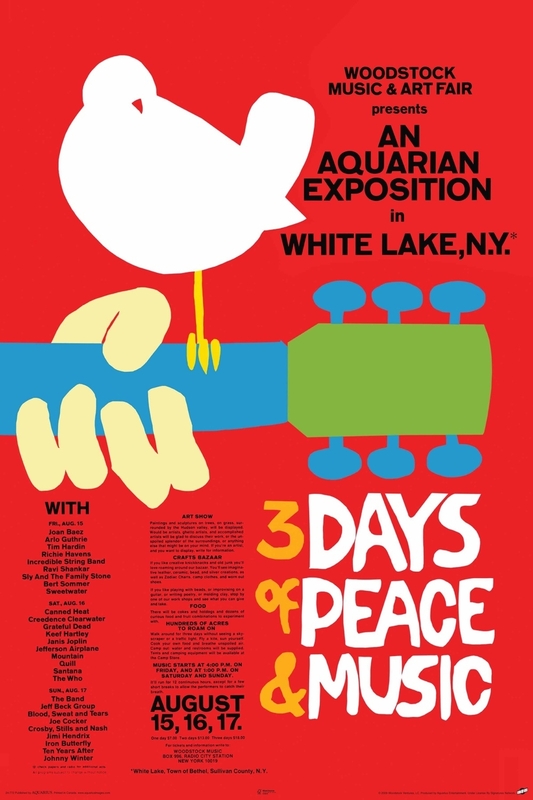 There are two Woodstock festivals that happened nearly 50 years ago: First and better known is the Woodstock Myth: the paramount Aquarian Age experience, as the mythic echoes imply, and they are not without a sizable measure of truth in some ways. The second is what really happened: the reality of Woodstock. I can only attest to what the fringe around the event was like. I hitchhiked down on Saturday morning from my hometown, Binghamton, N.Y., about two hours away on the other side of the Catskill Mountains. Then I hiked from Monticello on the interstate about halfway to the festival site at Yasgur’s farm in Bethel, through a traffic jam of parked vehicles on and along a two-lane road, trekking alongside a stream of others also heading to the fest. I ran into some friends in their car on the way and hopped in to hang out. Word filtering down from the festival site confirmed just what the cops announced as they rode past on horseback, waving us latecomers back (to no avail): It’s a disaster area. Then again, others reported that they’d heard that The Beatles were on their way. Late in the day, as the traffic jam opened up and state troopers urged us to move on (and away), my friends and I shrugged – “Wanna go?” “Yeah why not…” – and turned around and went home. I never really regretted the decision. Much to my surprise, the reality of the atmosphere around Woodstock over those three days was captured quite accurately in the 2009 Ang Lee movie, Taking Woodstock. It’s a rather charming little film that tells a side story to the fest. The scenes of the crowds on the roads going to and from the festival look and feel exactly like what I experienced. Given how hideously inaccurate most film and TV portrayals of the 1960s counterculture are, it was gratifying to see that Taking Woodstock got it right. The rain. The mud. The sound sucked unless you were close to the stage. Barely any food and not much to drink. Too few porta-potties and they quickly overflowed. The music scheduling was a mess. It was a pain to get there and not so easy to get out of there and back home. Or, in a few words, it was a big mess. So most of them didn’t come home infused with the bliss of the Aquarian Spirit even if their time there was a gas, as we said in those days. And let’s not forget: the festival site was declared a disaster area. The promoters lost a bundle. Some 3,000 people suffered medical emergencies; around 400 sought help for bad LSD trips (“Don’t take the brown acid”). And three people died: one inside a sleeping bag was run over by a tractor, another succumbed from a heroin overdose and the third died from a burst appendix. A woman broke her back falling off a scaffold. Considering that nearly half a million people gathered at and around the festival site, those bad numbers are pretty slim. And one big true force behind the truth within the myth is how promoters Michael Lang, Artie Kornfeld, John Roberts and Joel Rosenman just accepted their fate that the site was overrun, and did all they were able to make the music happen and festival proceed as best they could under very challenging conditions. 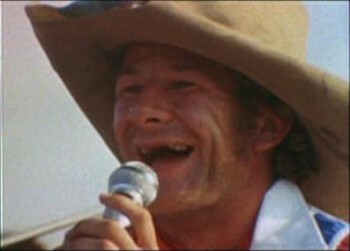 Due credit also goes to Wavy Gravy, the Woodstock “Chief of Please,” and the members of his Hog Farm commune security team that made people indeed feel “secure.” Also to the locals who endured the onslaught of young people with kind patience. And the officials and law enforcement who responded to it all with equanimity. And ultimately the synergy among all those who attended. It was close to miraculous, really. 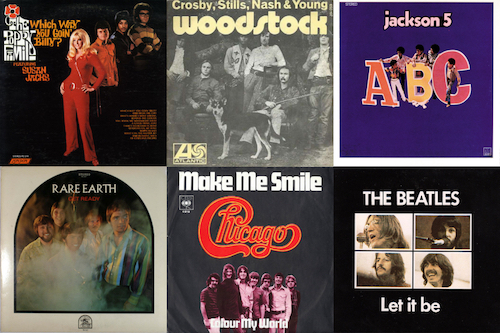 Then in May the next year the Crosby, Stills, Nash & Young take on Joni Mitchell’s song “Woodstock” topped out at #11 on the Hot 100 and the idealization began. I didn’t run into children of God walking along the road toward Woodstock. Instead, the feeling I got after a number of years of getting hassled and threatened with beatings for my hair being too long and dressing weird was that, wow, look at how many of us there are. It was a comforting, if all-too brief, moment of knowing I was not so alone in being outside the mainstream, a measure of solidarity with a burgeoning subculture. I imagine a similar realization by the hundreds of thousands on the site fed into their communal and cooperative attitude over the three days of the fest. We were all among an astounding and reassuring number of kindred souls. 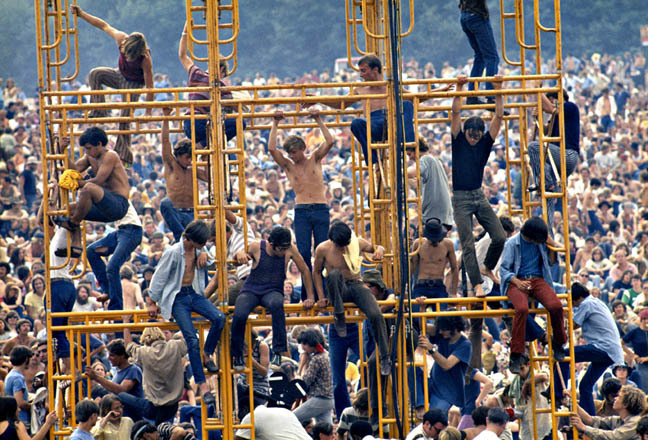 Fans on the sound tower at Woodstock Festival 1969/Photo © Elliott Landy, LandyVision Inc. 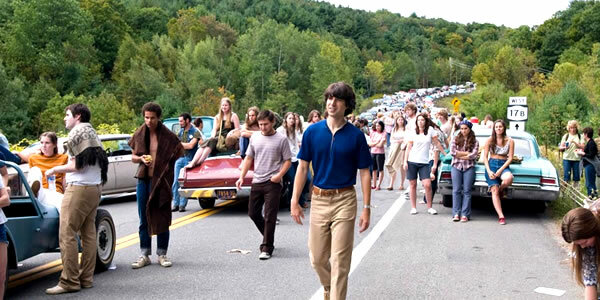 The Woodstock movie directed by Michael Wadleigh hit theaters that same May. The music was revelatory, and the second unit shots from backstage and around the site – directed by Martin Scorsese and his longtime editor Thelma Schoonmaker – conveyed some groovy and true “you are there” vibes. The promoters luckily covered their losses when the film became a huge hit. 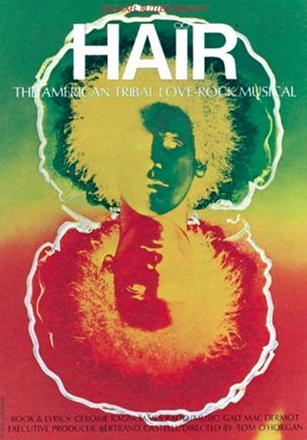 Add in the simultaneously released three-disc live soundtrack, and it was a hat trick that sealed Woodstock’s stature as the late 1960s festival, even if there were others around that time like the July 4th weekend Atlanta International Pop Festival (more on that here), the Atlantic City Pop Festival two weekends before Woodstock (read BCB Editor Jeff Tamarkin’s account here) and the Texas International Pop Festival two weekends later, all with amazing bills. And they all came off without any of Woodstock’s hitches which, in a way, helped start ginning up the Woodstock myth because the festival overcame them. And the myth isn’t all that removed from reality. But iconography cannot help but breed mythology. In this case the disparity isn’t all the great, but it does exist. When history enters the slipstream of popular culture, it cannot resist the hungry maw of mythology. 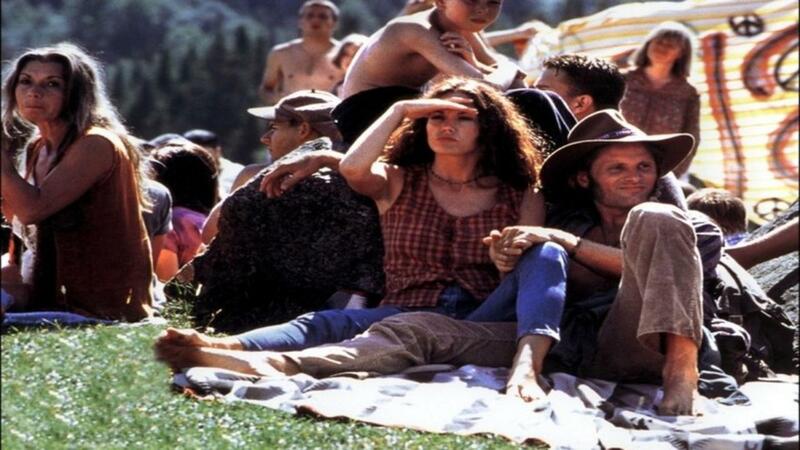 The worst Woodstock example of that I came across was about a dozen or so years ago when I happened to watch the 1999 Diane Lane/Viggo Mortensen movie A Walk on the Moon. She’s a married-too-young housewife and mother summering in the Catskills in 1969. 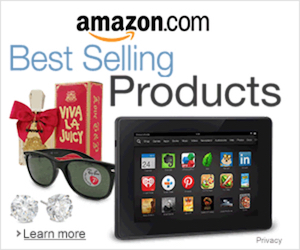 Viggo is a traveling salesman with whom she runs off to Woodstock. One scene at the fest show the two of them standing on a hillside of pristine green grass, no one else within 10 feet of them, only a gaggle of folks in the distance down the hill huddled around a stage. I grumbled a lot about how that’s not at all what it was like. But even if I didn’t quite make it, Woodstock is nonetheless an inescapable skein in my life. 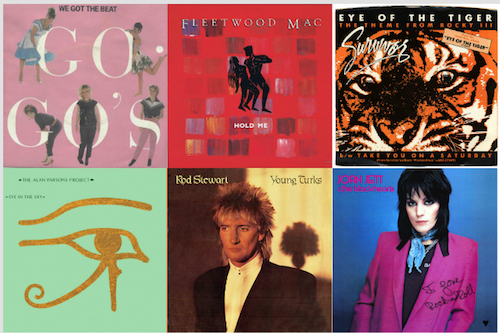 Especially after I spent its 15th anniversary during my rock music publicist days in 1984 in a limo in Manhattan going with Lang and Wavy Gravy from The Today Show to Good Morning America and then downtown to the World Trade Center, where CNN broadcast from, for a midday show. Since we got there early, the three of us – with Wavy in his full clown regalia; he was one of the first true original hippies and wonderfully remains one of the last – spent the intervening time going up to the observation deck atop Tower One and then down into the mall in its bowels for an early lunch. Wandering around WTC with a clown reminded me some of what it was like to be a freak in the late ’60s. Some people looked on us with friendly delight; others regarded us with askance glances – a litmus test of people’s coolness. Ever since September 11, 2001, I’ve been trying to parse the congruence of such pivotal events. I can only guess that the Chinese curse “May you live in interesting times” carries a comparable measure of blessings. The traffic jams ? That was me and my buddies. We worked there from Thursday thru Tuesday directing traffic and pushing cars stuck in the mud. It paid $2.00 an hour, and surprisingly, I received a check for $80.00 less taxes a couple of weeks later.And it didn’t bounce ! So sorry man, if we hadn’t been so stoned, and actually knew how to direct traffic, you might have made it there. I didn’t make it to Woodstock but I played an important role in the 20th Anniversary Woodstock at Bethel event. 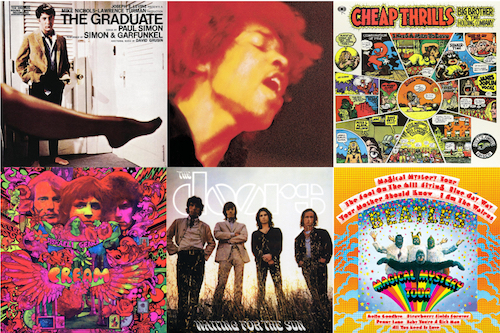 It had the true vibes of what Woodstock meant and reached the mythic heights of the Original. That year, there was a’Woodstock Festival’ with lots of major Rock Stars at a different location – Rob can fill you in on the details – and they spent a good amount of money spreading the negative word that the ‘real’ Woodstock at Bethel wasn’t happening; that it was just a rumor. They blanketed the airwaves and media with that assertion. In the meanwhile, with the help of Sid Bernstein, stages were being built and Artists like Richie Havens. Melanie and Arlo Guthrie volunteered to play gratis. I got the use of the international press list from Madison Square Garden and sent a press release around the world announcing the ‘real Woodstock’ reunion at Bethel. Well, although there was real doubt that Bethel was happening, almost a hundred thousand people showed up the first day! They came because they believed that they should be there. As word spread to the other Woodstock with its SuperStar lineup, people started leaving the commercial concert where they charged a lot for water and wouldn’t let you bring in any food or liquid of your own. The second day, we had over two hundred thousand people. We charged nothing and The Rainbow People and other groups provided food and took care of people. We had nearly enough porta-potties, but emptied them often. At 8 AM each day we announced it was cleanup time and everybody came out of their tents and sleeping bags and took the garbage bags we provided and in less than an hour, the grounds were cleaned! Everybody was aware we were the Woodstock Nation and love and peace was in the air. It deeply effected the performers as well: there was magic all day and night, from the Artists you knew to the least known. Everybody put their heart and soul into it. The only thing that was missing was the mud! We did and do live in interesting times! I made it to Woodstock and never regretted a thing. I had just turned 17. I was there for five days from Thursday to Monday. Went with two buddies of mine. They are still alive and we are still friends. We took a series of buses from Albany to Bethel. We brought a tent and plenty of food. We shared what we did not need. I witnessed many random acts of kindness and not a single fight. We all heard about the poor soul who got run over by a tractor because he was camped in the wrong field. I never heard about anyone falling off the scaffold and breaking her back. I think if that happened word would have spread through the crowd as it did most of the weekend. I remember when a couple made love right out in the middle of the audience. Word spread quickly and we could see the girls legs up in the air. They got a standing ovation! All in all, I would have to say that the myth was very real to most of us. I have run into many people who say they were there or “almost” there. I can usually tell if they are bullshitting. I have many great memories of those days and absolutely NO regrets. Rain? Mud? Who cares? To this day the smell of wet alfalfa brings back all the sights, smells and sounds of what was one of the great experiences of my life. Peace and love to all my brothers and sisters! We went. We drove down from Vt and ended up staying at a friends parents house in Ellenville. The main draw for me was that the Beatles were reuniting and I really wanted to see them. Imagine my surprise and dismay when all I got was Joe Cocker singing “with a little help from my friends” Who the hell is Joe Cocker? I was bummed. I did get to hang at the Hog farm and groove with Mr. Gravy. That was fun. It was all fun as I remember, but not as much fun as Newport Folk the year before. The Beatles were “reuniting” in 1969? Nonsense, they hadn’t even split yet! In fact, ‘Abbey Road’ hadn’t even been released when the concert took place.